(Custom exempted within North America NAFTA zone). Air demo at only 1/4 bar (4 psi). Fan demo at 4 psi (1/4 bar), too much torque for this strong man! Unlike vane pumps, which vane extension is important and against which the pressure acts to generate the rotation, the Quasiturbine contour seals have an imperceptible extension and the rotation does not result from pressure against these seals. Since the cylindrical (or oval) stator of vane devices has a radius of curvature greater than the rotor, the two surfaces (rotor - stator) cannot reach a close fit at top dead center (TDC), while the surfaces of both the rotor and stator of the Quasiturbine fit exactly against one another to produce a high compression ratio. This is why QT is efficient (less pressure charging losses), and this is why there is no vane combustion engine. Quasiturbine publishes « efficiency data ». QT.6LSC (shown here) without the differential and the central shaft. which totalized 4,8 litres per revolution. In most reciprocating piston engines, the flow reverses its direction at each stroke (counter-flow). By entering and exhausting the cylinder by the same port, the cylinder valve and walls are cooled by the passing exhaust, while the hotter incoming admission is wasting some of its energy in restoring the temperature. Some energy is further lost in reversing the motion momentum of the mass of gas within the piston. The aim of the piston uni(directional)flow is to remedy this defect by providing an exhaust port at the end of the stroke, making the gas flowing only in one direction, but has the inconvenience of recompressing some residual cylinder gas. Quasiturbine is a uniflow engine, with the further advantage of not recompressing any residual gas, resulting in superior energy efficiency. Recompressing residual gas means some reversibility losses, and the pressure increases makes a substantial restriction to the initial flow into the chamber, not to ignore the truncated cycle near bottom dead center - None of this with the Quasiturbine. Displacement: Total = 8 x 600 cc = 5 litres intake per revolution. Cylindrical outside about 16" (~40.6 cm) in diameter excluding peripherals. Thickness 5 " (~12.7 cm) excluding shaft and peripherals. The casing and rotor are made of metal (no aluminum at this time). 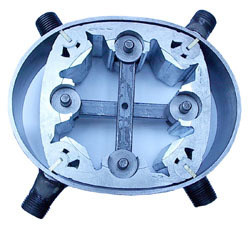 Power shaft: 1 1/2-inch (~3.81 cm) diameter throughout. 2 intake ports 1 " male NPT pipe threads. 2 exhaust ports 2 " male NPT pipe threads. Weight (all metal) about 150 pounds (70 Kg). - Intake pressure: 60 psi (4 bar) peak. - Temperature: Near room temperature. Up to 250 N-m (200 pound-foot) peak (with no step down gearbox). Maximum Temperature Control: Provision for thermal expansion is for now limited to a air motor rotor temperature of 60 C, and 150 C (300 F) upon special request. Exceeding limit temperature is noticeable by a sudden rpm reduction, in which case one should not insist and let the QT cooled down before trying again in proper condition. Hydraulic : This Quasiturbine must not be use with incompressible fluid (liquid hydraulic mode) - When possible, avoid excessive internal liquid condensation and do not flowed with lubricant. Usable with intake pressure from 1 to 60 psi (4 bar) peak! while the « energy cost » to run less efficient equipments may lead to no overall saving. the Quasiturbine is by far the least expensive innovation to familiarize with! = 64 + 64 = 130 N-m / bar (3.2 + 3.2 = 6.4 pound-foot / psi). The power output up to 12 kW peak, which is proportional to the product: Torque X rpm. Typical value given as indication only. May vary from one QT to another. at 500 rpm and up to 60 psi (4 bar), and is given as an indication. Perfect « single-stage theoretical expander curve » is shown for comparison. The graph is from measurements at 500 rpm and under 60 psi (4 bar). = 5 litres x 500 rpm = 2,5 cubic meter per minute. The « minimum theoretical air consumption » is exceeded by the same ratio as pressure-flow efficiency, which correspond to substantial saving when compared for example, to low torque high rpm vanes motors (see details below). Expanders expand the gas of a reservoir, but not necessarily the gas within the expander. The efficiency is a ratio expressed in %. It is used to evaluate an equipment result in relation to either the incoming energy (Semi absolute efficiency - when for example for gasoline engine: energy extraction, transportation and refining are discarded), either in relation to a partial form of energy (relative efficiency), or in relation to the result of an other equipment or reference theory (comparative efficiency). To further complicate the situation, different engines with same efficiency on bench test will lead to different efficiency applications (in mobility for example, due to weight and gearbox requirement). No correct efficiency interpretation is possible without knowing detail calculation. Consequently, it is not possible to optimized simultaneously an expander for maximum power and maximum efficiency, a choice must be done. Devices are not all equally efficient when attempting to match this theoretical piston-cylinder model, but Quasiturbine does it (with no intake cut-off) at +/- 80 % of the perfect theoretical single-stage (with potential improvements up to 95 %). To reach such a level of comparative efficiency, other concepts need to run at nominal power only, or to use intake cut-off techniques. Such techniques are adaptable to the Quasiturbine as well, for an overall top performance. Note: There is more intrinsic energy in the compressible incoming flow (energy accumulating in the infinitely long cylinder as the piston moves) that single-stage expanders are not attempting to recover (it is not within their tasks), and which end up in the exhaust. Additional recovery would require cut-off intake valve and multi-stages (QT?) expanders, but at a much reduced machine specific power density (larger expander and higher cost). Selecting a high efficiency engine is a good start, but other system components and thermodynamic cycles also impact the global system efficiency, which should not be confused with the engine component efficiency. (* Estimated at 4 bar (59 psi) as 5 times the IVFR of 0.3 m3/min). 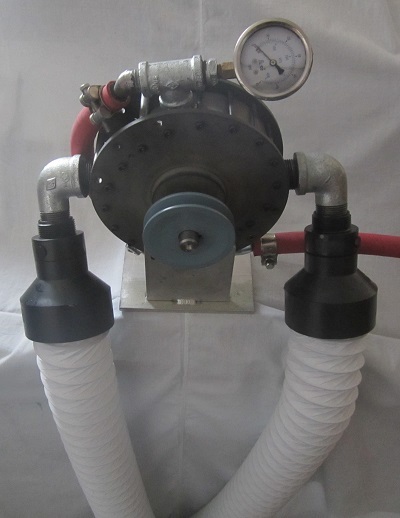 (* Estimated at 7 bar (103 psi) as 8 times less the flow of 2.0 m3 free air /min). From the energy reversibility (heat lost) point of view, the difference is even greater, as one consumes its air volume at 7 bar (100 psi), while the QT consumes it at only 4 bar (60 psi). In conclusion, the Quasiturbine concept (without intake cut-off) operates at 80 % of the Theoretical Single Stage (TSS) Power, compared to 40 % for Vane Motor concept (even when using some intake cut-off saving), with QT potential to reaches 95 % under high mechanical tolerances. Furthermore, QT operates in the most demanding conditions of high displacement, low pressure and high torque. 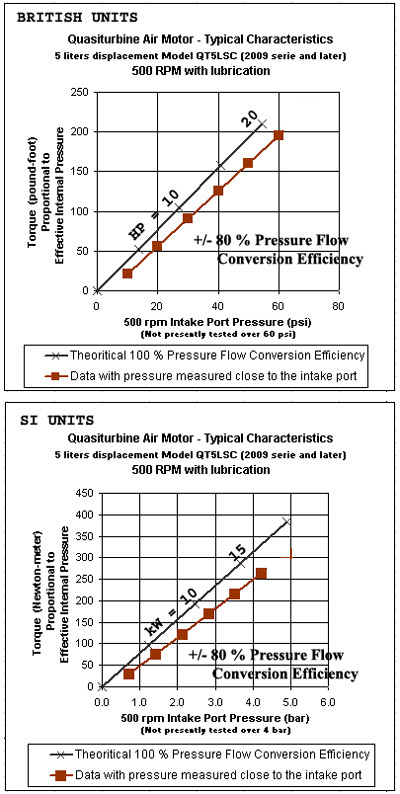 Consequently, the Quasiturbine air/steam concept exceeds substantially the relative efficiency of Vane Motor concepts, which is consistent with the vane loading chamber volume lost. For many applications, there is little or no benefit to use low cost vane air motor when the pressured fluid consumption is the dominant cost factor. Periodic oil needs to be injected into the motor intakes steam flow. The best is oil injection within one of the intake port using a small pulsed pump (electrical or pneumatic). An other convenient way is to keep an oil reservoir pressurized (with air?) slightly over the QT intake pressure, and to simply control the oil flow through a needle valve. Pneumatic tools oil is a good choice. Air motor can also use standard steam cylinder oil ISO 460 which contains 4% tallow oil. This is the grade of oil that the “ride-on” locomotive community uses. It is generally available in 55 gallon drums, but Sulphur Springs Steam Models sales@sssmodels.com provides it in quart cans. Chevron USA has a relatively new steam cylinder oil on the market that is lighter in viscosity than ISO 460 by about half (1103 SUS vs. 2335 SUS @ 100 F). Other steam oil may do as well, search " steam cylinder oil" on the web for local suppliers. It does not require much oil, and it can be recirculate. Never use motor oil or inappropriate lubricant. Never use oil with additive like antifriction, because large air flow or steam oxidized the oil and precipitate the additives in « glue like product » fatal to the Quasiturbine operation, as it will oxidize and degrade into solid or viscous material under steam contact. If this happen, attempt cleaning the engine with a glass of kerosene in the intake, while turning the engine slowly by hand. Re-oil properly. and flow speed increases again into the exhaust, which must show minimum restriction. after air expansion (few meters). This preserves pressure differential and full power of the QT. could also be a valid solution. but the volumetric flow does not. A good set-up require a short and generous size feed line and exhaust line. It is also preferable to add an damper-buffer tank in the vicinity the expander to absorb pressure fluctuation and provide a smooth engine flow. As delivered, the Quasiturbine has no pretention to be a sealed machine, and in particularly at the shaft bearings (leak increasing with exhaust back pressure). Because Quasiturbine can be used with a multitude of gases (some environmentally sensitive), and considering the multitude of seals available, it is up to the owner to apply if needed, its proper sealing solution to the system (Look in Search Engine Image for « Axial Radial Shaft Seal » or « Replacement Cartridge Mechanical Seal »). Some seals cost less that 10 $ to buy, but high temperature seal could be a challenge. General info at www.skf.com/files/889495.pdf . While thin wall enclosure is an ultimate solution for critical situation, stuffing box (made of a simple outside washer bolted to the engine block) with Graphite Coating Packing Sealants could often be an acceptable straight forward solution. Turning in reverse a Quasiturbine air motor will (in principle) make it act as a compressor (not efficiently if not properly design for that role). However, the direction of rotation can be keep the same, if both exhausts are plug by a small check valve line taking the exhaust pressure exit as the compressor output. Then, to prevent the air motor intake two lines to be vacuumed, a check valve on them allowing-in atmospheric air will suffice. This kind of switching motor-compressor mode without changing the direction of rotation will later be useful for application like windmill back up pneumatic air storage or vehicle breaking energy recovery device. is intended for integration research, demonstration and projects. To be use only under competent supervision. Guaranty is limited to the replacement of defective parts. and constitute the terms and conditions accepted by the buyer. Email the form to info@quasiturbine.com or fax to 514-527-8484. An invoice will follows with payment instructions. (Terms: Pick-up or shipping the day the funds transfer is received). A 12 poles AC generator would be a good RPM match with Quasiturbine. A fraction of the engine output is lost in the electric conversion process. Gas Pipeline Pressure Energy Recovery : What about an « energy recovery rotary pressure regulator » ? An interesting application of the pneumatic Quasiturbine is to recover the pipeline high pressure energy at local distribution stations. Instead of using a conventional pressure regulator (an energy dissipative device), a pneumatic Quasiturbine will rotate under the pressure differential and the flow will be controlled by the rpm, i.e. the torque applied on the Quasiturbine shaft. It does act as a dynamic active rotary valve. This way, the Quasiturbine can transform the pressure differential into useful mechanical work to run pump, compressor, ventilator, electricity generator or locally convert the energy in high grade heat (better than pre-heating the gas before that same "rotary expander", to avoid any residual condensation as done with conventional regulators). Substantial heat is now given to conventional expansion valve in pure lost, while heat given to the gas at the intake of a rotary expander is essentially all recovered in mechanical energy or electricity. Because conventional turbines can not be widely modulated in rpm and load, they are not suitable for gas flow and pressure control, while the Quasiturbine is essentially a closed valve at zero rpm, and has high efficiency at all torque and all flow rpm. With such a system, any heat added before the Quasiturbine expands the gas and increases the available volumetric flow with the result that this heat is converted in mechanical energy with a very high efficiency. All experimental demonstration has to be done only by gas experts and under all current rules and regulations. Ignoring gas expansion and considering only the gas pressure flow, a 36 inches diam. gas pipeline at 700 psi carry typically a pressure power in excess of 30 MW - 25 millions of pound-ft/sec - of zero pollution pure mechanical energy almost totally recoverable through Quasiturbines in the heart of cities and industrial parks. This is tens of giant windmills on kW-h basis!. A survey (M. Dehli, GWF Gas-Erdgas 137/4, p.196, 1996) showed that in Germany alone, the potential for utilizing this pressure in 1996 was 200-700 MW, and the gas consumption has increased since then... See the pipeline technical paper and the Quasiturbine Rotary Expander. Enhance efficiency of LNG liquefaction cycle : Adsorption Refrigeration Engineering Thermal Physics. Conventional pressure regulators make all the gas to expand from the constant high pressure side, and the gas pressure-kinetic energy at the needle is converted into undesirable heat, reducing accordingly the amount of cold produced. 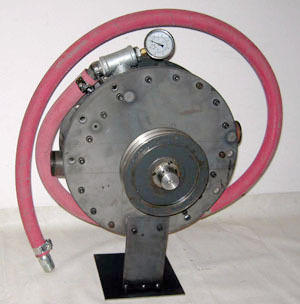 The Quasiturbine rotary expander allow for individual chamber to expand at a variable reduced pressure during expansion, and such reduces the gas kinetic energy transformation into destructive heat. Furthermore, the Quasiturbine recuperates mechanically the gas differential pressure energy, which can be used to run more compressors and make more cold... A double energy efficiency gains! A single Quasiturbine in tubo-pump (tubo-compressor) mode could have one circuit used as rotary expander while the other is used to compress back some of the expanded gas. This offers great enhancement of thermodynamic cooling machine, and specially in high power LNG - Liquid Natural Gas liquefaction stations. Of course, this efficiency enhancement is also available for more modest cooling system and air conditioning equipments. With Quasiturbine rotary expander, the efficiency of a gaseous only (like dry air) system reaches almost the efficiency of a phase change liquid-gaseous system, and sophisticated phase change chemical products often environmentally unwelcome are not anymore needed. See Quasiturbine Rotary Expander. Low Pressure Modulated Power Station : Solar radiation varies greatly during the day while most engine keep their optimum efficiency at design power only. Because the Quasiturbine (steam or pneumatic) keeps it high efficiency on a large power range, it is well suitable for modulated (from source or demand) power production like solar, windmill, ocean wave station... where the pressure is generally low, and efficiency critical! A 10 second vehicle Power Booster : Originally, hybrid was intended for efficiency increase, not for performance increase. More and more vehicles use 2 engines not for fuel savings, but to increase acceleration performance: As a 10 seconds Power Booster, benefiting a government grant! In this regards, the Quasiturbine QT5LSC pneumatic with an onboard air tank and compressor could eventually provide hundreds of additional HP for 10 seconds, and make an unbeatable acceleration Quasiturbine Hybrid vehicle... the market seem to ask for? Many others applications require high power bursts, like in smooth landing parachuting (with fast line-winding in less than 10 seconds). ORC (Organic Rankine Cycle) : Engine suitable for ORC (Organic Rankine Cycle) in Solar, Geothermal and Waste Heat Recovery. Current research lab precaution and procedure must apply. Familiarize yourself well beforehand with the Quasiturbine technology (see the associated site at: www.quasiturbine.com ). Intended for near ambient temperature intake air (be careful not to run a supply air compressor for a too long period, which could overheat the intake air). For optimum performance, the feed line must be well balanced between the two intake ports, which could be done by ending the line passed the 2 T by an accumulator (buffer) tank (minimum 20 litres), on which the pressure gage can be located. Make it turns gradually (without abrupt acceleration). 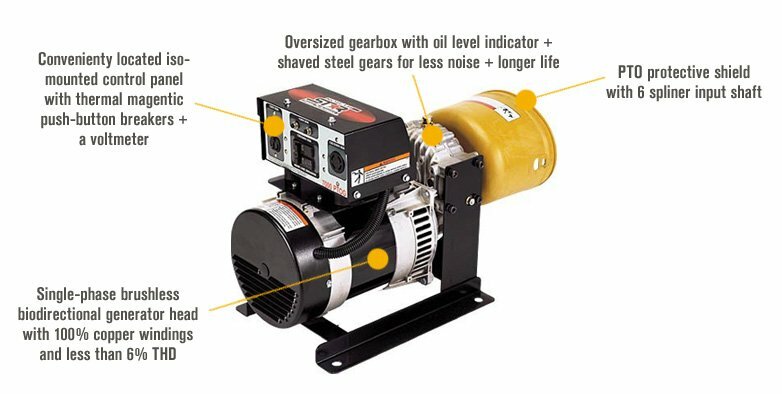 Ensure that the rotor is adequately lubricated (pneumatic tool oil only). (Never use oil with additive like antifriction, because large air flow or steam oxidized the oil and precipitate the additives in glue like product fatal to the Quasiturbine operation). The best is oil injection within one of the intake port using a small pulsed pump (electrical or pneumatic). A convenient way is to keep the oil reservoir pressurized slightly over the QT intake pressure, and to simply control the oil flow through a needle valve. Ensure that the hoses and fasteners (particularly the flexible ones) are of quality and well anchored. It is recommended not to exceed 600 RPM and/or 4 bars (60 psi) at the pressure gauge when under load, half without load. No free running at more than 20 psi. Intake air must be reasonably clean and near ambient temperature. Silencer could be used (not supplied) with some effect on efficiency. Must be operated under the constant supervision of qualified adults. Anchor the unit well before each start-up. Wearing safety glasses, mask and fastened hair is recommended. or the decoupling of any of the flexible hoses. Have a distant valve at hand to cut the air/nitrogen flow as needed. Always remain vigilant and careful! Sale and operation are restricted to adults only. no steam conversion attempt must be made (could be dangerous). Additional parts of replacement can be ordered by owners. The Purchasers release the manufacturer from all responsibilities relative with the use. Guarantee of the manufacturer is limited to the replacement (pick-up) of the defective parts. The present document and conditions must be transferred to the chain of future owners of the unit. If there is intellectual propriety risk, the manufacturer can simply refund and not deliver. The purchaser accept the present page as part of the purchase order agreement and invoice. The price includes the applicable local sale taxes if required, but not the shipping (pick-up) costs. The insurances and customs fees are the responsibility of the purchaser. As possible, shipping (pick-up) will be made on schedule following the reception of the payment, or according to the production capability of the moment (Check for « on the shelf » inventory...). Failure of the buyer to make final payment or take delivery of the unit within 3 months of the notice of completion will be interpreted as an abandon of the product without compensation.